"The Big Tiny" Book Givaway! 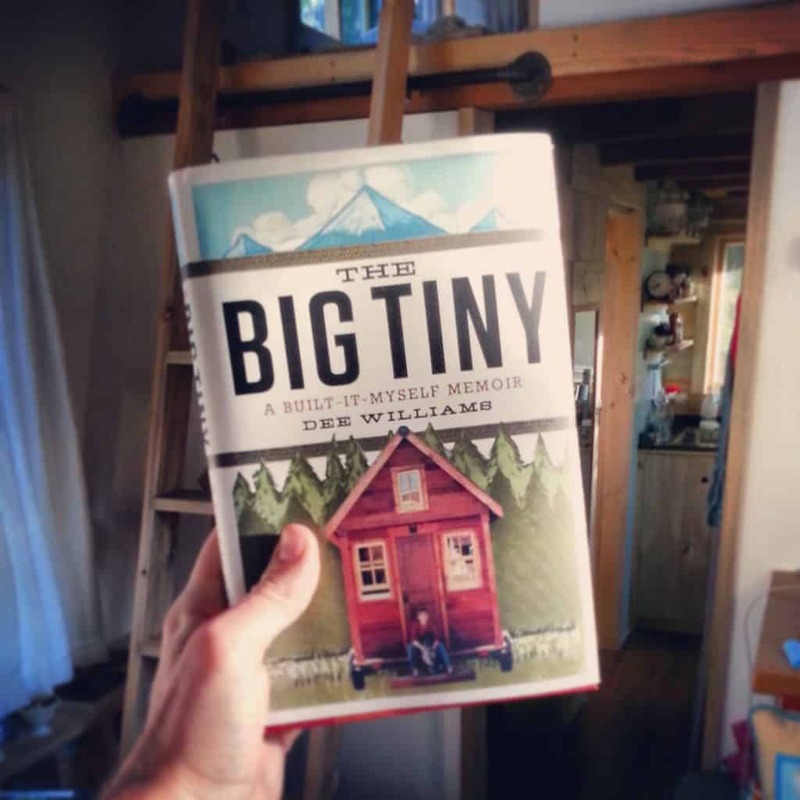 Dee Williams’ new book, THE BIG TINY: A Built-It-Myself Memoir, is about to hit the bookshelves. But guess what? We’re giving you a chance to win your won copy of this book for free! I’ve had the pleasure of meeting Dee at the beginning of my tiny house journey. In fact, it was a weekend workshop she put on with her company Portland Alternative Dwellings (PAD) that gave me the confidence and inspiration to take the leap and go ahead with designing and build my own tiny house. This book is great in that it details her personal story and gives an in depth insight into her process of rethinking and downsizing her life. Entering this giveaway is super simple. If you’ve signed up in the past, you don’t need to sign up again. In your comment, please include a brief description of your favorite thing about what The Tiny Project has to offer. Complete transparency: What we’re really asking for is a good testimonial about our plans for sale, our photo book, or something else about the Tiny Project website you find helpful. Show us some love, and maybe you’ll win a great free book! One week from today, one winner will be randomly picked from all those who have met both of the above requirements. The winner’s free, brand-new, hardcover copy of the book will be shipped directly from the publisher. THE BIG TINY is a graceful and inspired memoir about building a home from scratch and discovering a true sense of self – in just 84 square feet. Ten years ago, Dee Williams was diagnosed with congestive heart failure, and she soon realized that she wanted to make some changes. In the wake of her health problems, and considering the burdens of homeownership, Williams began fantasizing about a simpler life. THE BIG TINY follows Dee from the early days of her diagnosis through the increasingly-confident building process (Dee constructed her entire house on her own – with help from a few friends), and ultimately finds her in present-day Olympia WA, living with her dog in her tiny house in the backyard of friends. Although most of us don’t imagine our lives unfolding within such tiny dimensions, there is something universally appealing about the way Dee lives: simply and efficiently, with awareness for her community and environment, and with an open mind. Without escaping to the wild or going off the grid, she’s achieved a happy balance of the normal and the radical, and created a model for simple, practical living. What I find most inspiring about the tiny project is the knowledge that home construction is within the reach of the average person and that you can come up with some pretty unique designs while remaining within the 8.5×13.5 oversize load profile. The Tiny Project blog has taught me there’s other alternatives than the monotonous, sedentary thing we call “life”. The thought of graduating and entering adulthood scared me. Not because I was nervous about finding a job, but because I was afraid of existing instead of living. Existing by going paycheck to paycheck, working nine to five and coming home to an apartment I can’t afford to live in but have no other choice. Once I discovered this site, everything clicked inside me. I have completely switched my life goals around and take new initiatives every day to prepare myself for a tiny lifestyle. “Adulthood” now has a whole new meaning, and I am forever grateful for this inspiration. Congrats, Brittany — you are the randomly selected winner of Dee’s book, “The Big Tiny” – I’ll be sending you an email to the address I have on file from our mailing list. Please respond to that email or send me your address via the contact form on this website. We hope you enjoy Dee’s story! The Tiny Project house is equal parts rustic and modern. A very liveable design! Your house design has really opened my eyes to the advantages of a shed style roof, how to make a small space seem huge by using lots of windows, how to incorporate lots of functional storage ideas into such a small footprint, and how to combine different siding materials without making it look hodge-podge. ( is that even a word? LOL ). Thank you for the eye candy, and inspiring all that follow in your awesome footprints! This project shows the potential out there for people to have their own home, without having to buy into the materialistic attitude of bigger is better ! Hi, I am Carly and I am about to be a newly graduated student. In planning for the future, I am highly considering the building of a Tiny house. I see it as a great way to pay of my student debt as fast as possible! I so badly want this book! I send many hours exploring this website and planning for my future! It would be awesome to win this book. My dream is to have my own tiny house, but need some extensive help on making this happen. I am hoping Dee’s book can help with this process. I think this is the greatest thing sense bread! This gives some one who can not afford the conventional home buying or building to have a home of there own, I realize your plans are for 1 maybe 2 people but it still makes one dream of owning and working on plans to have a home of there own. to the 3 A’s…Alek, Anjali & Anya…. Would love to win Dee’s book. I first became interested in tiny houses as a homelessness solution, like Quixote Village. Now I’m having tiny house dreams of my own. Hearing more about her story would be fabulous. Finally away to live understated. We use to much of just about everything these days, so to see a viable alternative is most refreshing. They are very cute. What would the movie stars do????? with their 6 bedrooms and 10 bathrooms? The ‘Tiny Project’ page has become like a garden bed, it is full of the nourishment and ideas from which I get the inspiration and motivation for moving towards my goal of my own tiny house. Honors to those who go first…and who graciously share their journey! I love this idea! I wonder if I could keep one in my backyard and have it move with us? Very Nice project, i love the Way you use every squareinch. Love tiny houses hope to build my own in the near future. Thanks for putting this book out. The tiny project is fantastic but unfortunately just a bit too tiny for my family which includes 2 small children. I’d like to take the tiny house principles and adapt them to suit a family of 4. This makes a lot of sense…especially for two. The Tiny Project; the possibility of having a home and the flexibility to decide where to settle LATER has given me an achievable goal in life, a direction, something to look forward to. I can’t wait to get my hands on the blue prints and get started! The Tiny Project is the answer to thé most important question I have been asking myself; ‘Can I commit myself to living a more humble life in a smaller space’. For the first time I wholeheartedly believe I could. The love of my life has a very strong desire to cut himself loose from debts and struggles with the idea of settling in densely populated areas void of nature and living on other people’s terms. For his sake I’ve been asking myself what sacrifices I am willing to make and what I truly need to feel well and stay true to my own desires. I like to have a place to call my own, to have everything I need in close proximity and to have a true home. The Tiny Project has all but converted me. My loves’ dreams are suddenly attainable, realistic and no longer a -problem- but an option! Something I can truly join him in dreaming about with much of the less fears and doubts I used to have. I know that I can buy a normal sized mobile home and convert it to my particular (dis? )abilities with a no down va loan but they only pay something like 30% toward the total of the loan on a mobile home, but will grant out 100% remodeling for service connected disabilities(a ramp, wide doors, sit-in baths, etc.) For water/elect panels, weatherization(insulation) there are grants for vets too. Lets not forget grants for the contractors who’ll do the work if need be. like the government tried to do to the native americans, put them on reservations. I say this- I am not only a disabled american veteran, but a native american as well. I cannot be made to do something I do not want to do. I will speak my mind, I do believe I’ve earned that right and so have all my brother and sister vets out there. Build these places with consideration to the respect they all so suredly deserve and this world would be a much happier place. I’m done ranting, raving and projecting. Time for feedback, Anybody out there? So looking forward to my “tiny living”. Kids are grown, hubby of 30 years passed away, so now I guess its my turn. Always have been a hands on person, so I know I can accomplish this. Selling the house and property to one of my kids and her family for pretty much what is owed, with the stipulation that I can live on the property forever!!!. We will see what I can do, and I will keep you posted. The tiny project is one of several informative sources for “reduced” living that provide us with hope that I will finally simplify our housing dilemma. I’m beyond the obligatory BIG HOUSE and the challenge of housing a major tribe (15 kids, multiple dogs, etc.). My original inclination was to convert a school bus, but now a tiny house on a trailer foundation is most appealing. with the prospect of escaping city life. It would be an ideal situation for my wife, the writer as she would enjoy a changing panorama to provide inspiration. As for me, the peddler , (salesman to you), it would provide constantly changing prospect bases. Add in our desire to forsake the GRID and a tiny house on wheels spells heaven in the making. I had given up on EVER owning my own house , this project has given me hope and inspiration that it is indeed possible , just love it ! absolutely enchanting! and very inspiring to master living with less stuff, and closer to nature! Very much a goal in my life to aspire to as I head towards retirement. Live a simpler life and volunteer more! Whenever I get the email from The Tiny Project, I know I am going to learn something that will make my heart sing. You see I have no construction experience at all. But with the simplicity, ease-of-use, and big dreams that can all be wrapped up in a tiny houses that are presented by The Tiny Project. My dreams of home ownership and being a part of the building is now within reach. Thank you for all the wonderful articles, suggestions, construction tips, and pointers you bring with each and every newsletter/email. Keep it coming, you guys are great! P.S. I really want to want to copy of Dee’s book. She too is super inspiring! with which I had to deal for 60 plus years (65, I’m not hiding anything). I see the tiny house on a trailer as a perfect solution for our tendency to tire quickly of a particular area. My retirement and the fact that my wife is a poet and novelist remove the need for the usual work here/live in the same area hang ups. The Tiny Project has been a great source of information and inspiration to pursue the Tiny Life. The Tiny Project has renewed my hope in a future in a tiny house! I have watched as the movement has grown for years and always dreamed of it being a reality for me someday. I have four years until kids number four and five move out on their own, and I have begun to take the steps to put my tiny house plans in place. This project is instrumental in my future!!!!! What more could I possibly ask for! Thank you for all the wonderful information. Building a tiny house has been in the planning phase for a while now. However, a recent job loss as a single mom has moved the timeline up. I’m most appreciative of your dedication to knowledge sharing. Well done! I love the design of this house. Everything is well thought out and has it’s place. It just fits. It’s a great model for solar which I would love to do eventually… This is the best layout I’ve seen!